The highly prized ability to make financial plans with some certainty about the future comes from the core fields of economics. In recent years the availability of more data, analytical tools of greater precision, and ex post studies of business decisions have increased demand for information about economic forecasting. Volumes 2A and 2B, which follows Nobel laureate Clive Granger's Volume 1 (2006), concentrate on two major subjects. Volume 2A covers innovations in methodologies, specifically macroforecasting and forecasting financial variables. Volume 2B investigates commercial applications, with sections on forecasters' objectives and methodologies. Experts provide surveys of a large range of literature scattered across applied and theoretical statistics journals as well as econometrics and empirical economics journals. 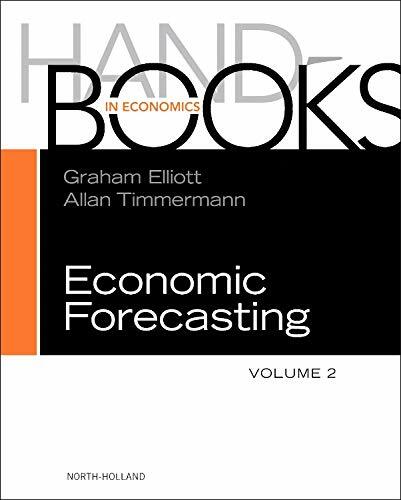 The Handbook of Economic Forecasting Volumes 2A and 2B provide a unique compilation of chapters giving a coherent overview of forecasting theory and applications in one place and with up-to-date accounts of all major conceptual issues. Co-Editor of the International Journal of Forecasting, Graham Elliott is a Fellow at the Center for Applied Macroeconomic Analysis. Allan Timmerman has served as an associate editor on the editorial boards of forecasting, economics, and finance journals. A member of the UCSD faculty since 1994, he obtained his Ph.D. from Cambridge University.